Fried fish collars were a daily special that I couldn't turn down, notwithstanding our server's half-joking warning that some diners were "traumatized" by the prospect of picking around the bones and fins. If you've ever had the Japanese grilled version - usually done as hamachi kama - you know it's worth the "trauma." 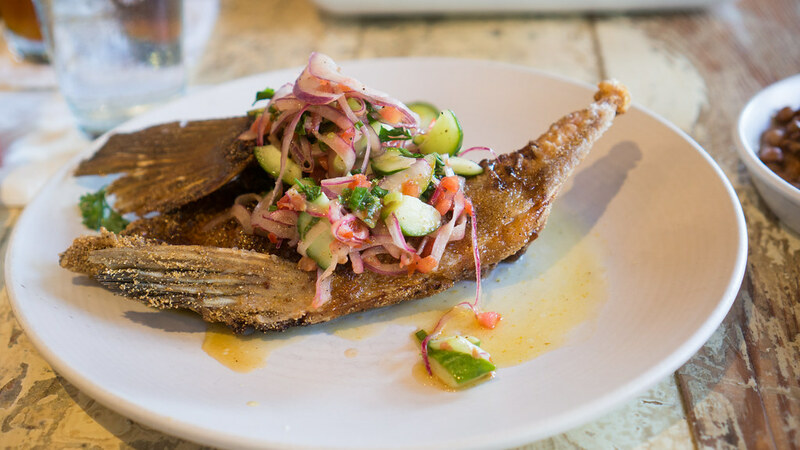 At Pêche, they use whatever's available - our server said it could be grouper or snapper or both - give them a light dusting of flour and cornmeal, fry them, and top them with a sweet-sour salad of shaved onion, cucumber and tomato with a bit of chili heat. Yes it's some work navigating your way around the bones and cartilaginous bits to extract all the meat, but it's worth it: the collar may be like the pork belly of the fish, the flesh so much more succulent and oily close to the bone. But for Chad, I wouldn't have even thought to order the field peas. I surely wouldn't have known that these weren't actually true "field peas," but rather were crowder peas. But apparently these are things you know if you grew up in Louisiana, as our server was quick with the acknowledgment when asked exactly what they were. It was clearly not the first time the question had been asked. 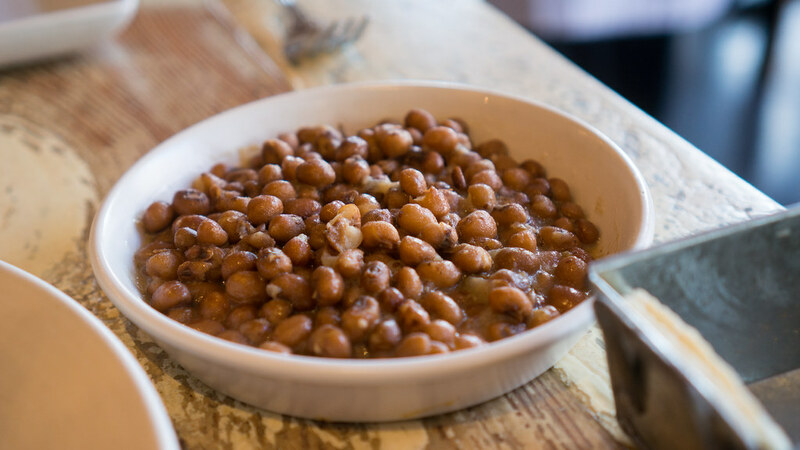 Whatever they were - they were delicious: tender and creamy but each pea still intact and distinct, with a hearty, earthy flavor and surely some rich pig fat involved in the cookery. I would have loved to explore more of Pêche's menu, but a second lunch was calling. The shrimp toast, crab and eggplant gratin, spicy ground shrimp and noodles, and assortment of whole grilled fish will have to await the next visit. 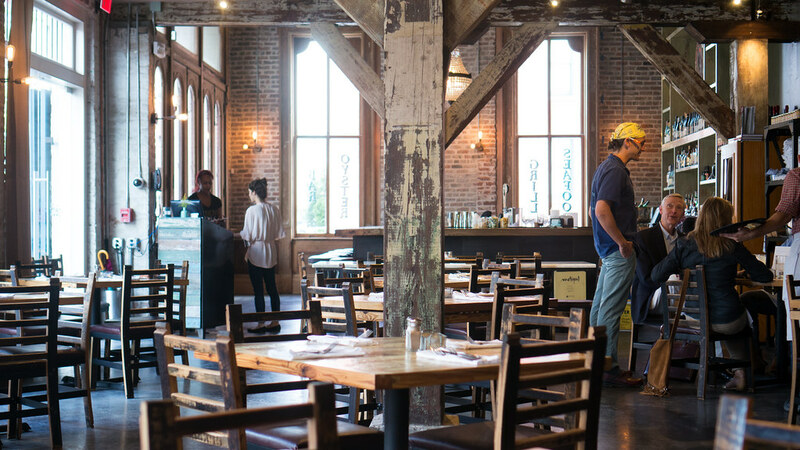 From Pêche, we walked a few blocks down Julia Street to our second lunch at Root. 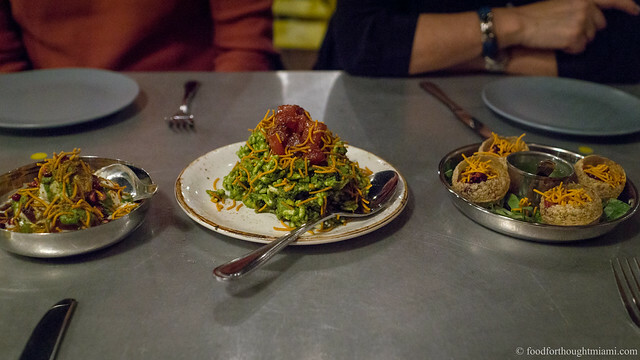 Root is a kind of restaurant that I can't imagine existing in New Orleans a decade ago. 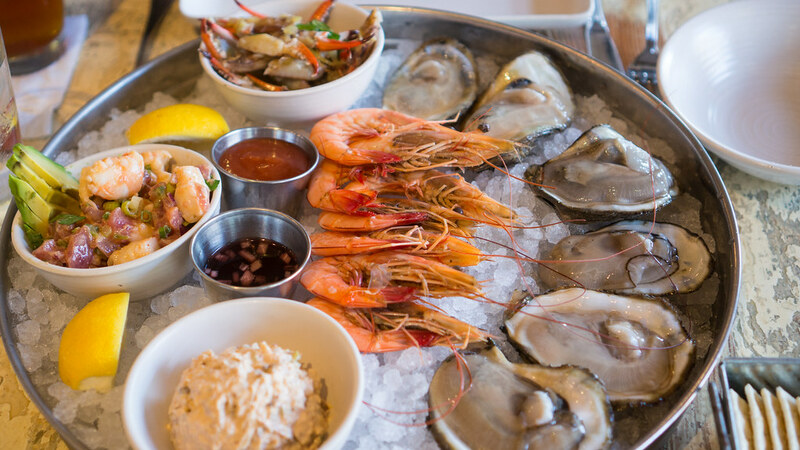 The style is thoroughly contemporary, and the flavors look just about everywhere other than the city's Creole and Cajun heritage for inspiration. 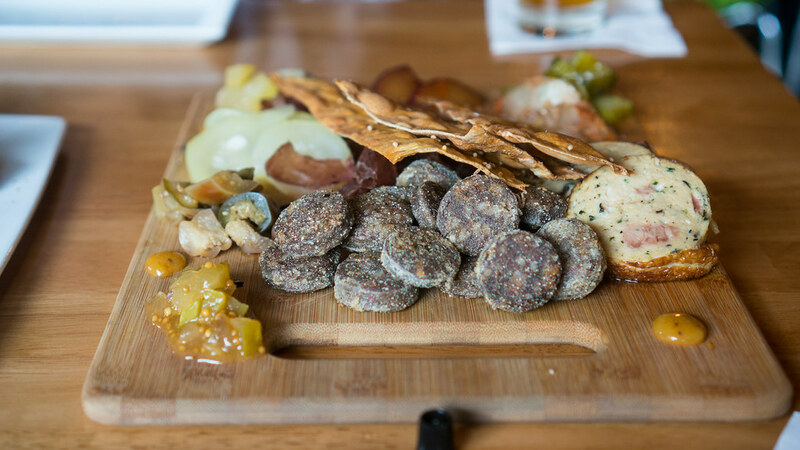 The menu bounces nimbly around the world - Peru, India, North Africa, Korea, and more are all represented - making a lengthy stop during all this globe-trotting for an ambitious charcuterie program offering nearly two dozen cured meats and sausages. (You can see all my pictures in this Root flickr set). That's where we started, with an order of their "CBD" (chicken, beef and duck) ballotine, Szechuan spiced beef tendon, chocolate and espresso cured lamb lomo, and Spanish-style morcilla, which were served with crisp flatbreads and a huge variety of pickled accompaniments. The lamb lomo, sliced paper thin, was permeated with the intense flavor of the coffee and chocolate cure. The beef tendon was all silky and gelatinous, aggressively seasoned with powdered sichuan peppercorn. Though I tend to like blood sausage in all forms, I prefer the loose, creamy texture that was lost when their morcilla was apparently cut into rounds and briefly dropped in the fryer before service. The ballotine, on the other hand, was some real elegant work, a delicate, pale forcemeat flecked with herbs and studded with bits of duck, wrapped in crisp chicken (?) skin. There was a whole lot going on in this duck heart "anticucho" salad: the meaty duck hearts themselves, petals of charred onions, each cradling a slice of pressed duck terrine, juicy compressed peaches, rounds of confited potatoes with a crispy exterior and creamy center, a drizzle of anticucho sauce, a scatter of mint and chervil leaves. Somehow it all worked, a pinball machine of flavors that all bounced together. The chicken gizzards dish was similar in structure, if not necessarily in the result. The gizzards themselves, slow-cooked for 48 hours and then dusted with a light coating and crisped up, were great. 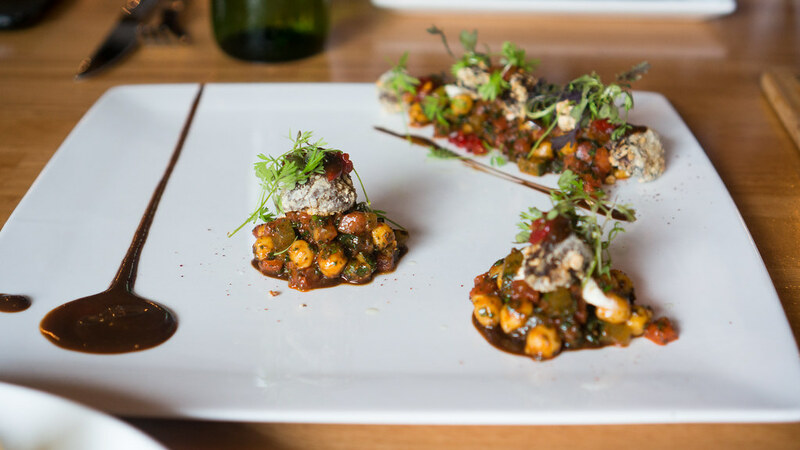 But they were overpowered by the accompaniments: the menu listed an Indian chickpea mint salad, a sumac harissa vinaigrette, a black garlic "XO" sauce, a goat feta mousse, and - if that were not enough - a sofrito marmalade. I'm not sure I could tell you how or where each of those items actually wound up on the plate. But it wasn't even so much the number of components themselves that overwhelmed - it was the level of salt in them which unfortunately just blew out my palate. The kitchen sent out a dessert for us which turned even the homely carrot cake into exotica. The moist cake was flecked with bits of carrot and spiked with South African Amarula cream liquor. 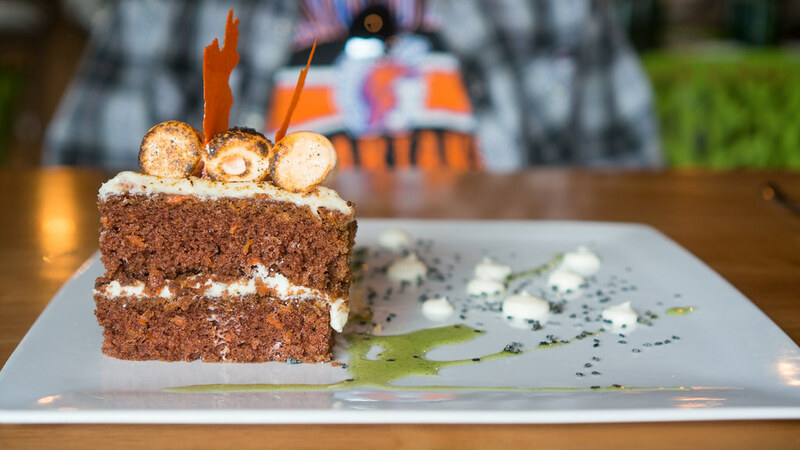 As a supplement to the usual cream cheese frosting, it was crowned with toasted, orange-hued, carrot-flavored marshmallows, and vivid orange sheets of dried carrot. A scoop of carrot-coriander ice cream, dots of celeriac crema, and a shower of nigella seeds (?) completed the composition, playing up instead of hiding the vegetal notes while still staying firmly in dessert territory. I was impressed. And I was impressed by the ambition of Root. There were a couple times I found myself wondering: is it possible for a dish to be too intense? But I can appreciate a place where my biggest gripe is that sometimes the flavors might come on too strong. Recuperated from my double-lunch expedition, the following day I paid a solo lunch visit to Coquette in the Garden District. The stand-alone two-story corner building, which dates from the late 19th century, exudes a charm that is undiminished by the otherwise nondescript block on which it's situated. The inside is all dolled up as if from a different century too: glass chandeliers and shaded sconces, wood paneling and mirrors, pressed tin ceilings and hexagonal tile floors, a long wooden bar stretching along one side of the space. (You can see all my pictures in this Coquette flickr set). That's where I situated myself, and had the nicest cocktail of my long New Orleans weekend. 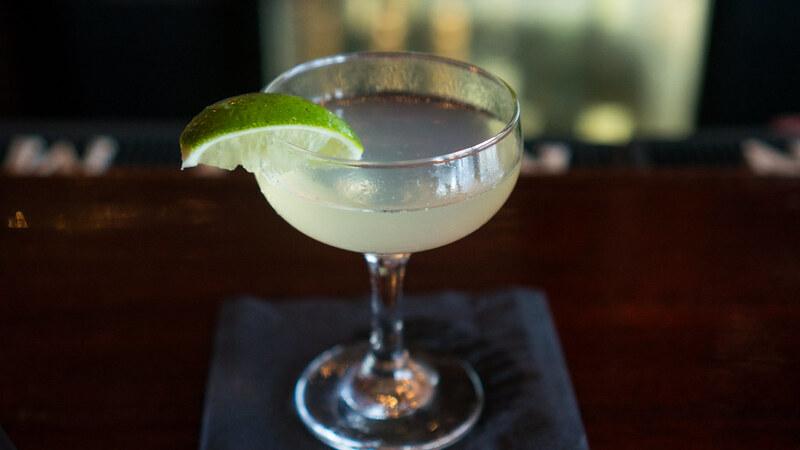 They call it "Le Reve" and it features G'Vine Gin, St. Germain, Chartreuse, lime, absinthe and sugar.It was a great daytime drink: fresh, bright, herbaceous, tart, complex but not heavy, and not overly sweet. I was surprised to see the bartender free-pour the drink: but when you still hit the mark, it's a welcome break from the increasingly ponderous 15-minute productions at many craft cocktail bars these days. The tete de cochon was simply done, and excellent. 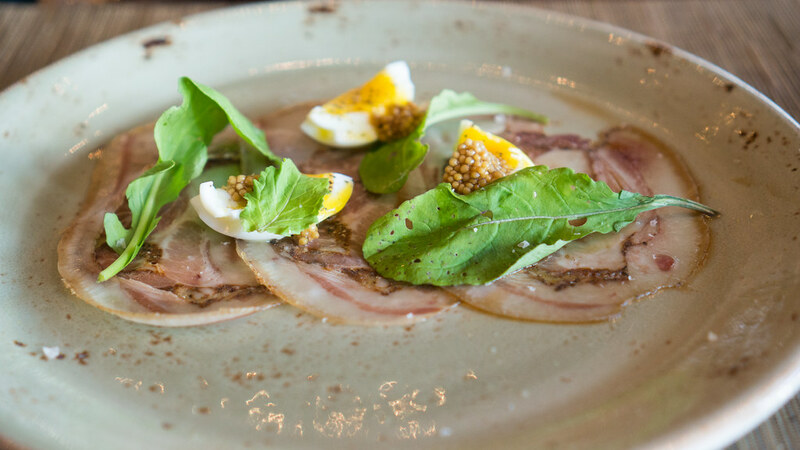 A few thin slices of the pressed headcheese, striated with ribbons of silky fat, flavorful meat and the occasional firmer bits of ear. A few slices of egg, the whites firm but the yolks still barely runny. Pickled mustard seeds for a bit of contrast in flavor and texture. Tender peppery arugula leaves. I loved it. 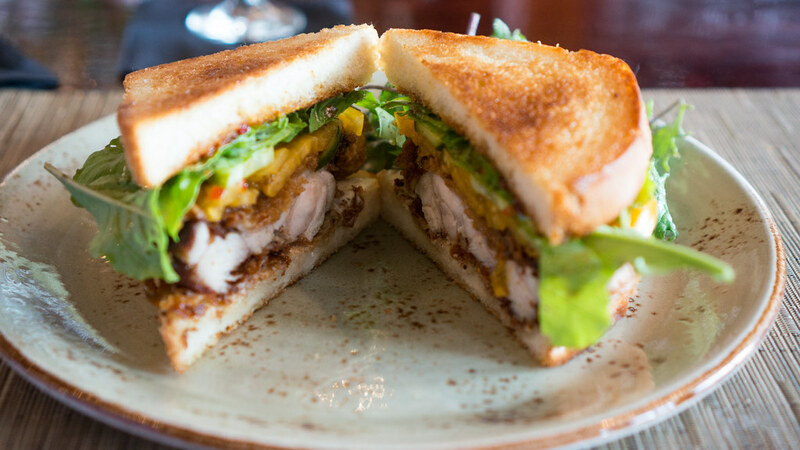 The fried chicken sandwich was every bit as good. The chicken had the ideal combination of a crackling crisp crust and perfectly juicy meat. House-made pickles and some pepper jelly provided just the right contrast of sweet, heat, and tart. Lightly toasted brioche bread was sliced thick enough to maintain structural integrity, not so thick as to overwhelm the other components. Maybe it was "Le Reve," but I was entranced by my small taste of Coquette. It will be high on my list for a more expansive repeat visit next time. Speaking of cocktails, I made a post-lunch excursion for an afternoon drink at Bar Tonique on the recommendation of The Chowfather. Unsurprisingly, it was a solid recommendation. Across from Louis Armstrong Park on Rampart Street, Bar Tonique is right on the border between the French Quarter and the Tremé. If you need another reason to head down that way, the Voodoo Spiritual Temple is only a couple doors down, and St. Louis Cemetery #1, where Marie Laveau is buried, is just a few blocks up the street. But you should require no such inducements. The drinks are reason enough to go. Their cocktail list is classical in focus and fairly encyclopedic in scope, listing several dozen options, most from the turn of the century. Of course there's an Old Fashioned, and a Sazerac, and a Vieux Carre, but also less heralded concoctions like the Aviation and the Last Word. Even Bar Tonique's own creations, like the "Rampart" (with Rittenhouse Rye, Aperol, Averna, whiskey barrel aged bitters and lemon peel) seem like they could have come from a hundred years ago. Having started the day with gin, I decided to follow suit here and tried their Corpse Reviver #2 (which also seemed appropriate given our proximity to the Voodoo Temple and the Cemetery). This post-prohibition cocktail was supposedly a hangover cure, but its recipe came with a warning from its creator: "Four of these taken in quick succession will unrevive the corpse again." I didn't test that disclaimer. I did thoroughly enjoy my (one) drink, though its resuscitatory powers may be overrated. I also thoroughly enjoyed the atmosphere at Bar Tonique. Usually a cocktail made with this degree of care comes with a bunch of other pomp and circumstance: vests and bowties and waxed mustaches. There was none of that here, just a friendly bartender dedicated to her craft. The place feels just as welcomingly unpretentious: a big rectangular wood bar with seating on three sides, a few tables scattered around the room, brick walls, chalkboards listing a portion of the drink selections - a big step above utilitarian, but far from fussy. Open from noon til 2am, with a rotating daily $5 drink special and then a $5 noon to 5pm happy hour special of selected $5 drinks (including an Old Fashioned, Sazerac or Aviation among others) on top of that, Bar Tonique is the kind of bar I wished I had in my neighborhood. We still had time for one last meal Sunday morning before returning home. 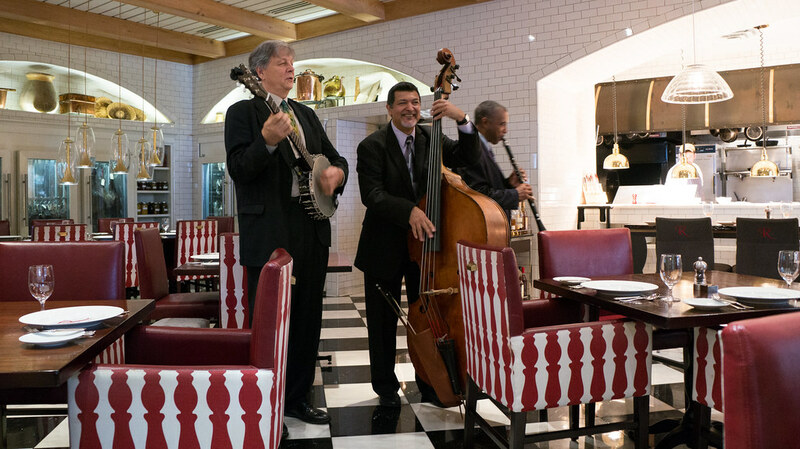 Sunday brunch has always been a big deal in New Orleans: the jazz brunches at Commander's Palace and the Court of Two Sisters are longstanding traditions for many visitors. We opted for something different, trying out the new Restaurant R'evolution in the Royal Sonesta Hotel. (You can see all my pictures in this R'evolution flickr set). I was a bit wary of R'evolution. The big hotel venue made me nervous, as hotel restaurants by their nature are inclined to pander to the tourist trade. 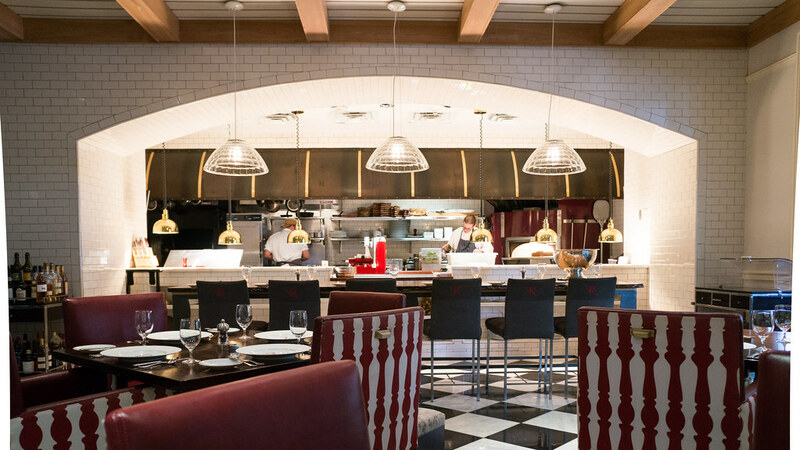 So did the unusual two-headed chef arrangement: R'evolution is something of a joint venture between John Folse, a long-time big-name Louisiana chef, and Rick Tramonto, a Chicago guy best known for his work at Tru, which he left a few years ago. On the other hand, it is an impressive place. 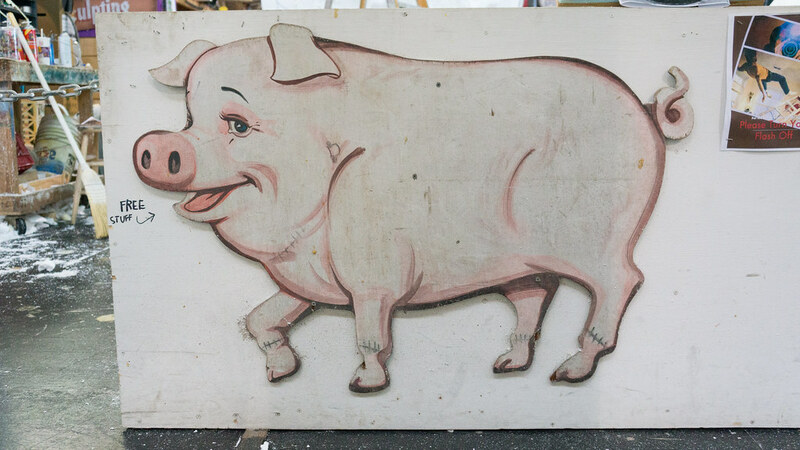 The dining room is broken up into several different spaces: a harlequin-tiled room adjacent to the partially open kitchen, a more sedate dining room with frescoes of farm scenes on the walls, a brightly lit stretch of tables along the windows looking out on Bienville Street. The kitchen seems to have every gadget a chef could possibly want: wood oven, rotisserie, smoker, steam oven, even glassed-in meat curing cases displaying their wares to the dining room. The doorway to the kitchen even had motion-sensitive sliding doors - which having seen them, I'm surprised aren't more common. The brunch menu is oriented more towards savory than sweet, which is my inclination as well. Stuff like gumbos, crab beignets, egg dishes, shrimp and grits, grillades and gravy is the focus; pain perdu with berries seems more of an afterthought. 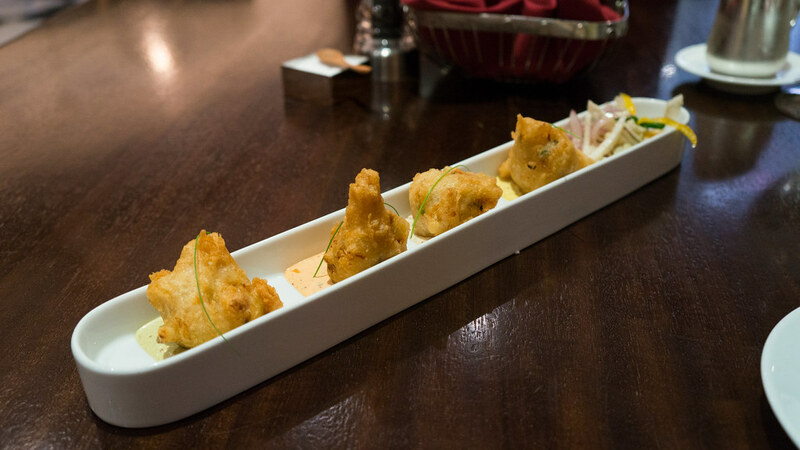 We started with the Crab Beignets, four beer-battered poufs of crab each served with a different variation on a remoulade sauce: traditional, saffron, salsa verde, and red pepper. These were good but unremarkable. 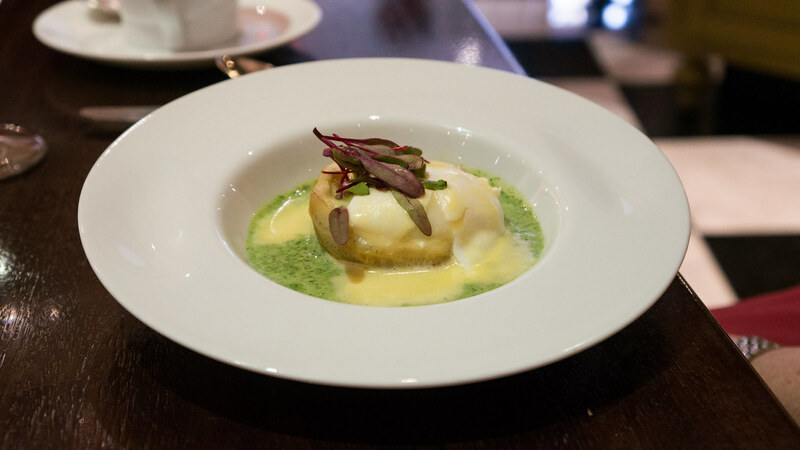 The Eggs Sardou made a much more vivid impression: a runny egg nestled within a tender artichoke heart, floating like a raft in a pool of absinthe-spiked creamed spinach, and doused in hollandaise sauce for good measure. It was probably wise that this rich dish came in a smaller, one-egg sized portion: any more may have been literally too much of a good thing. 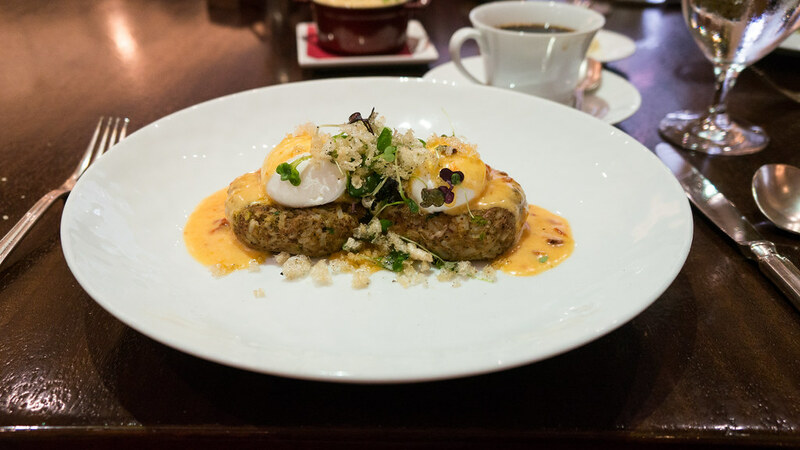 Another Louisiana staple - boudin, a Cajun pork and rice sausage - showed up in a dish of boudin and eggs. Two rounds of the assertively peppery sausage were crowned with a couple poached eggs, then topped with a silky sauce choron and a scatter of crispy pork cracklings. This was an elegantly updated take on a classic. Despite the name, I don't get the sense that R'evolution is looking to accomplish anything truly revolutionary. 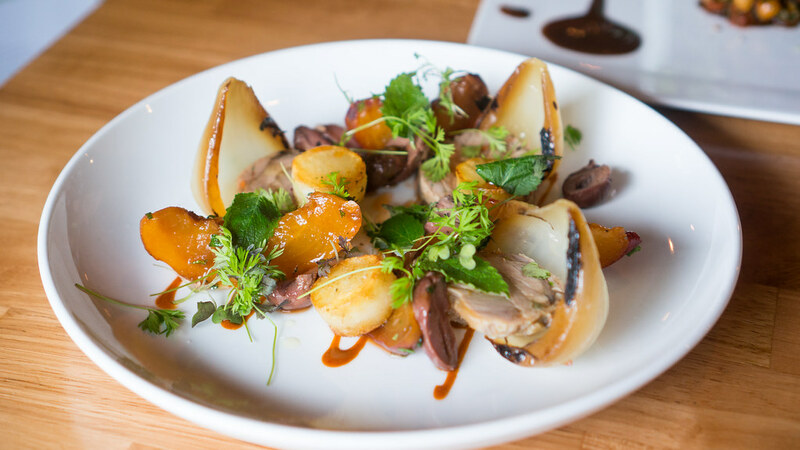 Rather, the focus seems to be on providing elevated, high-end versions of mostly classical dishes, and serving them up in a classy, polished environment. It may not be as innovative as some other new places, but it does what it sets out to do well. Even our server was a bit overwhelmed by the variety, nobly attempting to identify everything on the platter but clearly not able to remember the whole run-down. Still, I know exactly what she meant when she described one item as "pickled pickles." Chad knows someone who used to work in the kitchen at Root, and the word was put in.